Prepare for departure at the seventh annual 5K on the Runway. Launching Saturday, April 13 at 8:00 a.m., this chip-timed race is limited to 2,000 runners and spots fill up fast. Visit TampaAirport.com/5K for more details or to register. 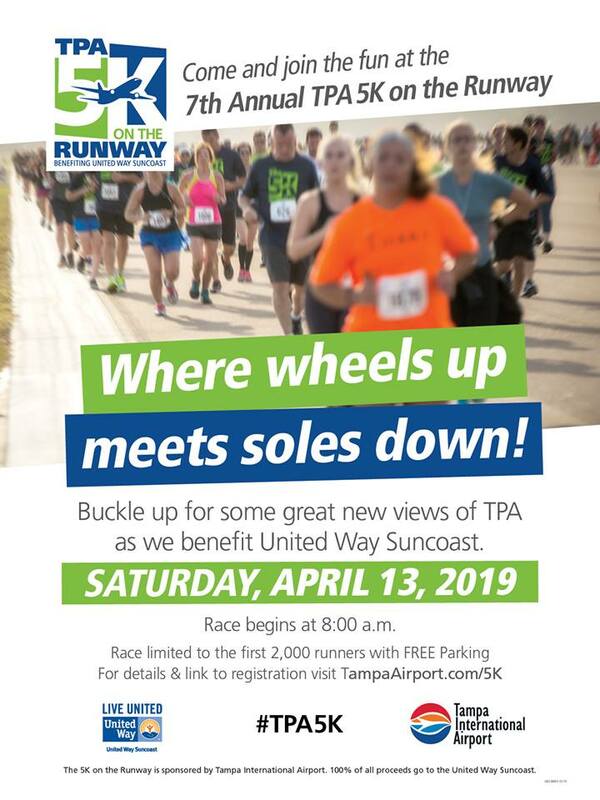 All participants will receive an awesome TPA 5K shirt and a finisher medal, and awards will be given out to top finishers in a variety of categories. All proceeds benefit United Way Suncoast. NOT IN TAMPA? Sign up for the Virtual 5K. Pick your own path and complete it at a time and place that is convenient for you. You will receive an awesome TPA 5K shirt and a finisher medal after the official event. Please note that if you sign up for the Virtual 5K you will NOT be able to run on the runway.